This one-owner piano is in top condition, outside and in. 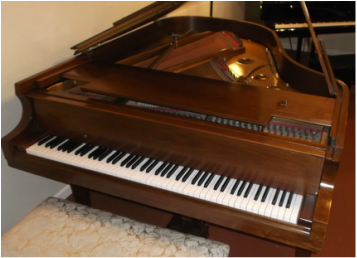 Made during the best period of Baldwin's piano making (1982) it is in virtually new condition! The sound is amazingly expressive from top to bottom. Powerful, brilliant, warm and lyrical, this piano has everything a demanding pianist would ever want. Hand-picked by one of Duluth's reigning professional musicians, and babied like a vintage Corvette, it is a piano which will make anyone a proud owner! The last person to play it was Melissa Etheridge in a live concert! She recognized its qualities and condition with praise from the stage! Come into the store to see how beautiful a piano can be, and play a little to hear the class of a former era of the piano builder's art. Comes with a newly upholstered duet bench with music storage.